Well, you are in luck! This segment includes weekly activities for you to play with your child. Sensory experiences are important for every single child. These activities provide the opportunity to explore and develop their sensory systems. They can be done any time and aim to inspire and guarantee a fun time. Each week you and your child will have the opportunity to experiment, explore and live a Sensory Lifestyle. To get started choose a variety of small cars. Then have various paint colors ready. Once you have a large piece of paper laid over the table or the floor is when the fun begins. Have your child dip the cars in paint. Then let the cars race over the paper and make tracks as they zoom by. Have the cars go in all directions; up, down, across, diagonally etc. At times encourage your child to zoom across the paper so their hand gets to move across their body. You can do this by getting them racing from one side of the paper to the other. You can also draw different stations on the paper that they have to reach. For example one side can have a drawn house, the other can have a gas station or maybe a zoo or a park. As they travel from different ‘locations’ they move their hand across their bodies and cross their midline. Large cars: Instead of using small cars you can use large cars that will provide a greater distance between their hands and the paint. Wet cloth: Have a wet cloth handy that they can use straight away to clean their hands from the paint. Remember not to push the actual paint contact if your child is not ready. Present it to them and then follow their lead. Most importantly… Have FUN!! I don’t think this activity needs much direction. Hopefully it will serve as a reminder of a very fun activity that can be done with kids of many ages. It also has a whole range of skills that can be practiced (See above). For those of you who let your child climb trees this may be just a reminder to find a cool new tree to climb and explore this weekend. Maybe include a tree with an extra challenge. For the children that have not yet had the opportunity to climb trees. I say go for it! If it’s the first time provide them with more support and then back away as their skill and confidence grows. Of course you should start with trees that have branches very low to the ground. Make sure to stay safe! Simply let your child explore the paint with their hands. Next, encourage them to move the paint from their hands onto the paper to create a colorful artwork. They can use their whole hands or individual fingers to paint with. The ability to separate individual fingers is an important skill that is used in most fine motor tasks such as writing, buttoning or picking up small snacks. The masterpiece can range from abstract to cute animals, cars or houses. Depending on their age they can put on as much detail as they want. Looking for some tactile fun to do with your child? Look no further… oobleck is here. Oobleck was inspired by the book, Bartholomew and the Oobleck by Dr. Seuss. It is considered a non-Newtonian fluid. What this means is that you can press it together into a solid ball but it quickly turns into a liquid and can ooze through your hand. In a bowl, combine the corn starch and water. Once it’s ready… let your child explore with their hands and maybe add some spoons or sifters/baskets for some extra fun. If your child does not like to get messy, have towels ready to clean their hands or provide tools that they can use instead of their hands. It’s spring time! It’s a perfect time to do some gardening. This activity can be completed by anyone, living anywhere. For an experienced gardener this simply acts as a prompt to let your children get involved with you. For the novice like myself there is no need to get freaked out. If you don’t know where to start you can purchase a gardening kit. It’s simple to follow directions and doesn’t require much space. There are many gardening kits available online. Gardening is great as it gives your child the opportunity to explore the dirt through their tactile sense but also gives them the opportunity to watch their hard work grow. The proprioceptive sense is also stimulated as they fill and empty their watering cans. If they are doing some heavy work through shoveling or raking they are also stimulating their proprioceptive sense and strengthening their bodies. This is more like an obstacle course that can be played like a ‘Mission Impossible’ adventure. To start grab some red yarn (lasers) and spread it across the room if playing inside or trees/fences if playing outside. Tie the yarn so it spreads across the obstacle space. Make some of the lasers low to the ground, some in the middle and some up high. The aim of this game is to try to get from one side of the obstacle course to the other without touching the lasers. Equipment needed: PVC pipes (various lengths), connectors (elbows, coupling, tee connectors, pvc cross etc), water. This is the activity that really allows your child to get creative and test the laws of physics. It’s all about connecting pipes in different formats and testing out what happens to the water once poured inside of them. I would suggest giving them all the equipment and some containers of water. Then, allow them to experiment. If they are unsure of where to start give them some guidance. As they start to get comfortable you can back away your assistance and watch the learning happen. If you haven’t gotten your kids into the kitchen yet, this may be the time. This is a fun and healthy recipe that your kids will sure enjoy making and hopefully eating as well. Throughout this recipe your child can be involved with as many or as few tasks. They can range from collecting ingredients, pouring, mixing and manipulating dough. The main component of this dish is the pici pasta. It is made from dough that is the same consistency as play dough. So basically you can have them having fun with it. To make the pici, you need to tear off balls of dough and roll them out into long, thin sausage shapes. As usual make sure you supervise all the tasks and enjoy the great flavors. If your child is old enough, make sure you get them involved in actually making Gak from scratch. Once your Ooey Gooey Gak is done have fun with it. What can you do with Gak? Squish it into an empty play dough container. WARNING: Strange noises might be heard during this maneuver! Hide small toys/objects in it. Then try to retrieve them! What are your favorite ideas? Feel free to share in the comments below. MODIFICATIONS: Do you have a child who is cautious with new textures? If yes then you can place Gak into a ziplock bag. They can still explore and interact with it without the slimy texture. Blowing activities are great. Through blowing, your child gets to work on their oral motor skills. They get to practice how to coordinate their lips, cheeks and jaw with airflow. Their muscle tone gets strengthened. They build awareness of their mouth, tongue, lips and jaw. This is a great activity that strengthens your child’s oral muscles and builds coordination. Oral motor activities also have benefits related to speech, feeding, respiration and regulation. As the child watches the colors splatter across the paper it also encourages visual tracking. So how do you play this activity and experience all of these benefits? Get an empty piece of paper. Give your child a short (around 2 inches) straw. Then either yourself or your child drops small drop of food coloring on their empty piece of paper. Lastly let your child blow onto the drop of food coloring and watch the colors splatter across their paper. You can repeat it with other colors. Once dry this becomes an abstract piece of art. Follow the recipe below to create your baked cotton balls. Depending on the age of your child you may want to get them engaged in making the cotton balls. Once ready it’s time to get smashing. They can break down the cotton balls through the use of their hands, feet or even a hammer. Just a note that the plastic hammer won’t make a dint on them but a wooden toy hammer is a go. Once you’ve made your dough, give your child some containers and spoons and let them explore. 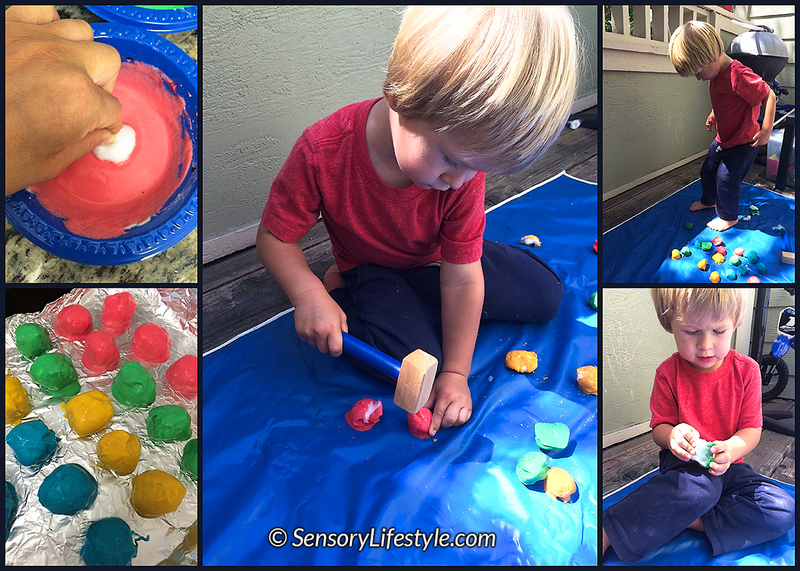 Cloud dough can provide lots of entertainment while expanding their tactile sense. When using it in therapy I always had to pack up a to go bag full of cloud dough due its popularity. Depending on the age of your child you can definitely get them involved in coloring the rice with you. Once the rice is ready, place it into a large plastic container and let your child explore and experiment. If you place the rice without mixing the colors they will have fun seeing the colors mix. They will get a new fun sensation on their hands as they swish and swirl and move it all around in different directions. You can also add a variety of spoons, sticks and containers to the mix. They can fill and dump the rice. Feel the weight in the containers. You can also start to encourage some pretend play. Maybe they will cook you something for dinner? You can hide objects in it. They can find it by using their eyes or if they want an extra challenge let them keep their eyes closed. For example ask them to find a ball or a small toy car by only using their hands. Don’t let them pick. Let them explore and see what they come up with. Also if you do not want to reuse the rice you might consider pouring in some water and see what happens. Equipment: I love water beads however I was looking for a more edible alternative. I came across Boba pearls. They are tapioca balls used in a popular Taiwanese drink and easily available on amazon. For a variety of colors I would recommend the rainbow boba. If you follow the instructions they are ready within 5 minutes. Once they are cooked and cooled they are ready to be enjoyed. I added some food dye to some of them for extra color. If used without water you will get a little bit of a sticky play experience. If used with water it will be a more slippery play experience. Manipulate with kids buckets, shovels, sifters etc. Found another fun activity you can do with these little beads? Leave me a comment below. Just as the name implies this is all about rolling down hills. I remember when I was a small child this was one of my favorite things to do. Whenever we went to parks I always looked out for tall hills. As soon as I did I would run up, lie on the grass and down I went. Rolling all the way to the bottom. These days I don’t see it as much so let’s get our kids to the top of those hills and encourage them to roll. For the little ones they may require help getting them started. Hopefully with a few rolls they get the hang of it and also get motivated by the fun. Depending on how much time for preparation you have you can do this activity two different ways. The first, is to get a large piece of white paper and attach it to a fence or a wall. The second, way is to cut out various shapes from white paper. The shapes can be as simple as circles, triangles or as complex as letters, cars, flowers, leaves etc. It really depends on your own skill and time that you have available. Next, mix some water with food coloring. Place it into a spray bottle and let the fun begin. Stick your paper on a wall or a fence and let them spray away. You may want to switch the water out for different colors or have different bottles ready. Not only is this a really fun activity but it’s great at strengthening all those small muscles in their hands. Initially they may be using two hands to squeeze the lever and as their strength builds they will only need to use one hand. An additional benefit to this activity is that it helps to separate the hand into two parts, which is important for many skills such as cutting. If your child loves popcorn this is a fun game for snack or anytime really. If they don’t like popcorn you can substitute with cheerios, pirate’s booty or anything else that will stick to their tongue. Basically this is a challenge game. To get going have them lying belly down on the floor. Then place popcorn on a plate and place it in front of them. The goal is to eat the popcorn off the plate without using their hands. Basically get that mouth going! Depending on the age of your child you can either challenge them to finish the plate off without using their hands. Or you can time them in how fast they can finish it off. Have fun and get eating!! This activity is really fun! That is if your child is into playing with slimy textures. Equipment: Large container of water, dish soap and toilet paper. First, place some dish soap (just enough to make some bubbles) into your water. Then, your child can tear small pieces of toilet paper and throw them into the water. As your child mixes all the ingredients together they will create a soft and slimy texture. Many children love to explore it with their hands. They can even try squeezing some of the paper together into balls while strengthening the muscles in their hands. You can also encourage putting their feet in to see how that feels. Make sure you support your little one climbing in and out so they don’t slip. If you get bored of the white color you can always add some food coloring to make it more colorful. MODIFICATIONS: Do you have a child who is cautious with new textures? If yes then you can explore the texture through the use of a large wooden spoon, a whisk or gloves. Parachute games are so much fun and you can play with them so many different ways. This activity is one way that you can get working on many great skills (see above). The main idea is to place different animal toys into the parachute and then get them flying. NOTE: Don’t include large plastic animals. You definitely wouldn’t want to get hit by anything large and plastic. Use either plush animals or small plastic ones. If you are unsure what an animal can do have your child come up with it or just be creative! This is one of the funnest bubble activities. 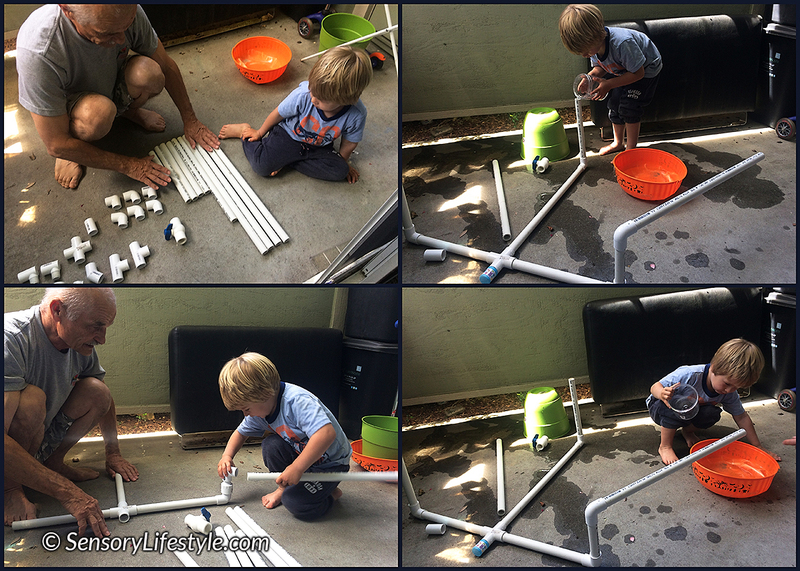 To start, you or your child will need to build your bubble construction. Don’t worry, it’s fast and simple! Fill your lungs out with air and BLOW!!! The bubbles don’t necessary have to stay a snake. They can be a train, a rocket or even a trumpet. Get the kids started and see where their imagination gets them. Have fun and get going with those creations! This is my old time favorite activity. I have lots of fun and muddy memories from when I was a child. Yes, your child will get dirty. But the fun could last for hours! All you need is dirt and water. Anything extra like sand toys, sticks and rocks are all an added bonus. Most of all HAVE FUN and GET DIRTY!! Balance, motor planning (ability to conceptualize, plan and carry out an unfamiliar task) and visual skills. Tactile, visual and proprioceptive senses. This activity is lots of fun, but it can get a little messy. I would recommend doing it either outside or staying away from carpeted areas. Simply place a long strip of paper on the floor (I used banner paper) with paint blobs on the corners. I found that using paper plates for paint placement gets more paint stuck to the feet which makes the activity more messy and slippery. Then let your child stomp away creating a master piece. This is a fun way to get your kids to experiment with texture. Get a large bowl or a container and have your kids add different items to experiment with textures. The great thing about this activity is that each kid controls exactly how far they want to push their comfort zone. The textures can move from dry consistency to wet. They can be sticky or lumpy. Anything… it’s only limited by the materials that you give them. They can also practice their mathematical skills by measuring all the ingredients. Then they can practice their scientific skills by analyzing and comparing their results as they mix different amounts. MODIFICATIONS: Do you have a child who is cautious with new textures? If yes then they can mix all the ingredients with a spoon or a whisk. Firstly, gather a variety of fresh herbs. This could be anything from sage, thyme, basil etc. Secondly get a mortar & pestle to help with the herb smashing. As your child chooses a herb, let them pull it off, feel it with their fingers and smell it. Then let them smash the herbs using a pestle. They will need to use quite a bit of force to get them smashed. Once they smash it all up let them smell it again. Hand eye coordination, bilateral skills and motor planning (ability to conceptualize, plan and carry out an unfamiliar task). Tactile and visual senses. In this game your child needs to get their cars dirty and then take them to a car wash. Put some shaving cream or bubble soap onto a table. Have your child explore the shaving cream with their cars. WARNING: They may have so much fun that the shaving cream ends up being splattered around. Have a small container of water ready so they can try and wash them in it. They may want to repeat this cycle numerous times.